So today I have been cleaning and organizing the office/craft room/mom cave. I ran across a lot of junk stuff I had totally forgotten I had. I picked a few things and decided I would do atleast one project a day using these things. Here they are.. I figure this is a great way to start clearing out stuff as well as give me a blog topic for the day ( trying to start blogging everyday ). Does anyone have any suggestions or ideas for any of the items in the picture? A piece of wood painted black, a glass flower vase painted yellow, an empty wine bottle ( Moscato I think ), a wooden duck painted green, 2 metal signs and one of those things you sit a big candle on? Lol … I already have a few ideas. If you listen closely you can even hear the wheels turning in my head, lol. Now back to cleaning and organizing the room. 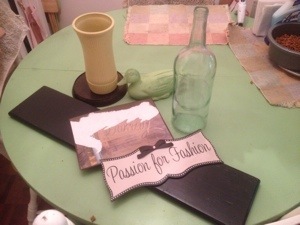 This entry was posted in DIY and tagged craftroom, momcave, Office by diyneophyte. Bookmark the permalink. Hey, I was just thinking that you can use the wine bottle for a few things. I have seen them filled with colored sand (which is a favorite of mine). But also as a tapered candle holder.I know there not much ideas but I have seen these projects many times and they have always been beautiful. Thank you for the ideas Darlene!! !